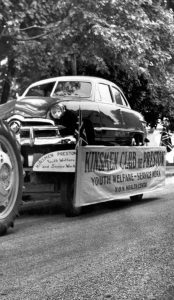 History of the Kin Club of Cambridge (Preston) Inc.
1920 The first Kinsmen club was formed in Hamilton Ontario by Harold (Founder Hal) Rogers. 1944 The Kinsmen Club of Preston was chartered. 1944 The Kinette Club of Preston was chartered. 1945 The clubs held a fundraising dance for the Milk for Britain campaign. 1950 Club held a raffle for a 1950 Ford. 1951 First annual Kin Carnival was held in the Preston Arena. 1951 First Dream Home Lottery, featuring a house on Coronation Blvd. 1961 Club commits $60,000 to build the Kinsmen pool in Riverside Park. 1967 As part of the Canada Centennial Year celebration, the clubs ran Calypso Days, which included bringing 60 performers from Jamaica, as well as a parade and a calypso show on July 1st. 1969 Kinsmen Day Care Centre opened on Shuttlestone Drive. 1970 Riverside Park “Kin Korner” playground equipment donated. 1970 Dumfries Park playground equipment donated. 1972 Funded “SCARF” Arena fire rebuilding project. 1974 Donated a new ambulance to St John Corps. 1975 Funded Central Park pavilion project. 1975 Donated $30,000 to GRCA to develop Hilborn Park. 1976 Made a successful bid with the Galt Kinsmen Club to have the Kin National Headquarters built in Riverside Park. 1977 Donated a handicap van to the Cambridge Capables. 1982 Funded the Cambridge Kips Gymnastic Centre. 1983 Donated a new Ford handicap van to the Cambridge Capables. 1984 Second Dream Home Lottery held. 1985 Sponsored Rick Hansen Tour Stopover and celebrations. 1986 Third Dream Home Lottery held. 1990 Kinsmen Splash Pad opens in Riverside Park. 1991 Kin Centre funded and opened, providing space for our rental hall and for the Preston Figure Skating Club. 1992 Sponsored Proud to Be Canadian Cross Canada Tour stopover and celebrations. 1992 Built a replica of the Kin Centre at the Children’s Safety Village. 1994 Founder Hal Rogers died. 1994 Contributed $50,000 for the new Chaplin Family YMCA Aquatic Pool. 1997 Rock Kin Roll Revival developed. 1998 First annual Snow Golf Cystic Fibrosis fundraiser held. 1999 Donated $19,068 for a defibrillator for the Cambridge Fire Department. 2008 Portraits of Honour mural project and cross-Canada tour. 2008 New Kinsmen Day Care Centre opens on Speedsville Road. 2016 The Kinsmen and the Kinette Clubs of Preston merged to form the new Kin Club of Cambridge (Preston) Inc.